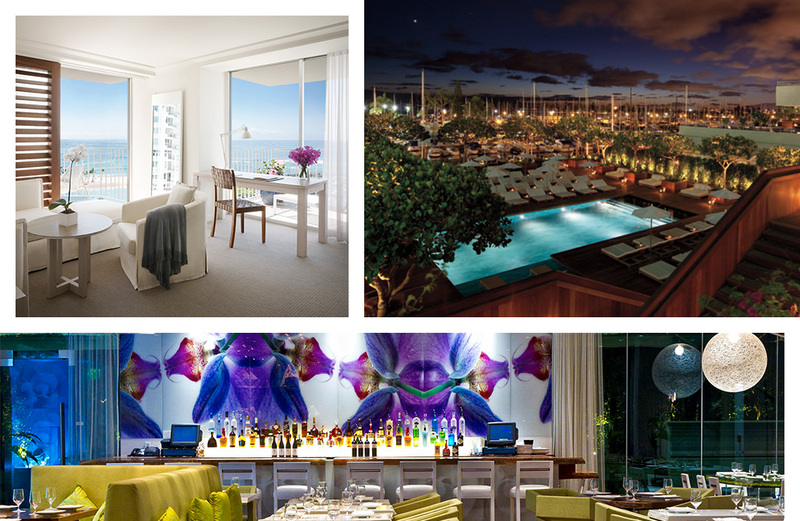 If laidback luxury is your kind of jam, then welcome—we’re checking in to The Modern, Waikiki. Coined as an ‘urban resort’, this modern (geddit?) hotel is oozing sophisticated yet chilled AF vibes, meaning it’s our kinda place, and the perfect spot for your next vacay. When you first enter the lobby, we’ll forgive you for thinking you’ve landed in WeHo (that’s West Hollywood, peeps), with mod-tropical vibes that’ll have you instantly calm and making a beeline for the pool. It’s all in the detail here at The Modern; with conspicuous details throughout the property to give off those they’ve-barely-tried at first glance feels, but the realisation that they’ve-bloody-nailed-it upon closer inspection. It’ll come as no surprise that the adults-only pool gets a big, fat yes from us. The Sunset Pool is an oasis within an oasis, boasting 180-degree views of the Pacific Ocean and harbour, with hammocks, daybeds and custom teak lounges so your only concept of time is at the bottom of your Mai Tai (which reminds us, it’s definitely time to order another). 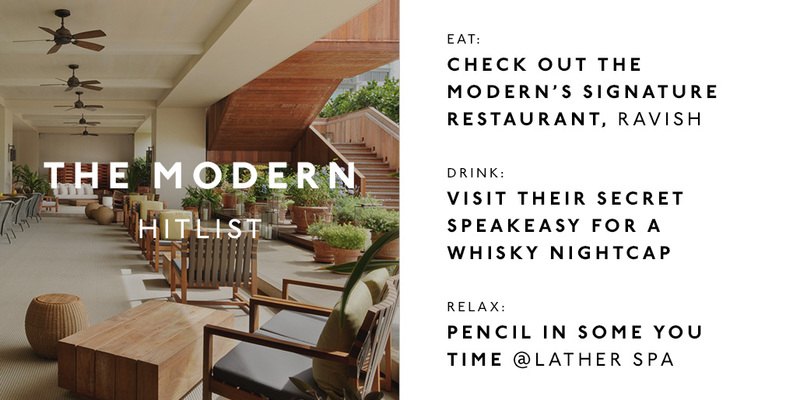 We’ll forgive you if putting Hawaii and whisky in the same sentence isn’t something you’d normally do, but stick with us. The Study is The Modern’s very own speakeasy bar, and it was voted the #1 whisky bar in Waikiki. You’ll find it in the lobby, past the large rotating bookcase (hot tip: the bookcase swivels open at 6pm), and complete with a wall-to-wall bar, leather lounges and just enough mood lighting to make this spot a primo choice for holiday date nights. When it comes to the menu, yes, they’re known for their whisky, but we can confirm that all (look, we tried our fair share) of their cocktails are better than good. So whether it’s something bespoke from their list or a dirty gin martini with three olives (please and thank you) you’re on to a good thing. We’ll admit that hotel dining isn’t always top of our list but, from someone who has a genuine fear of wasting valuable stomach space, to another—you’ll want to check out The Grove. The Modern’s signature restaurant combines harbour views, vintage tunes and some damn delectable eats to take your holiday dining up a tasty notch. Combining the best in Pacific rim cultures, their raw and chilled seafood menu with seasonal ceviche finished with red onion, coriander and lilikoi leche de tigre is a solid choice, and for the meat eaters, the 48-hour slow ribs are for you. Just make sure you leave some room (trust us, it’ll be hard) because you need to try the malasadas, we’re talking Portuguese doughnuts and a chocolate straw, ‘nuff said. Travelling is exhausting. Mai Tais by the pool are equally exhausting. Time to book your fabulous self in for a massage and lucky for you, you’ve come to the right place. 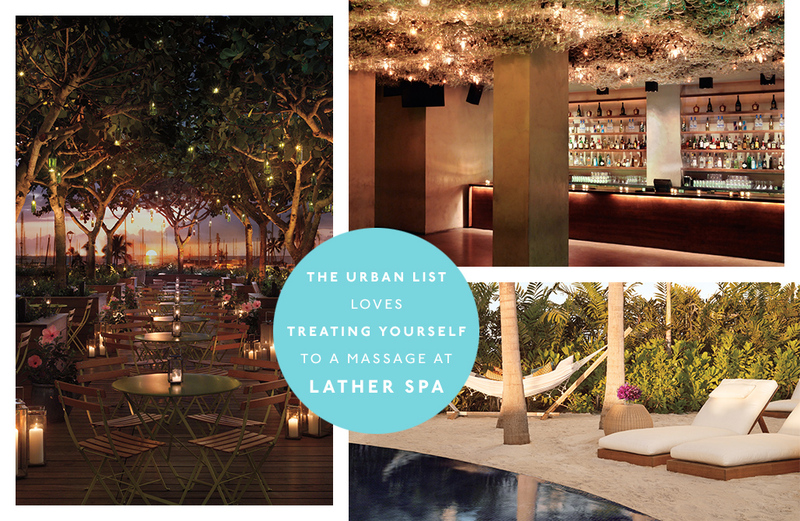 When it comes to hotel spas, like hotel restaurants, you can love ‘em or leave ‘em. In keeping with the theme, the Modern’s onsite spa Lather Spa is very much in the love ‘em category. It has everything you’d expect, as well as some ancient Polynesian traditions, like lomi lomi massage to remind you you’re in the pacific. The absolute highlight is tailoring your essential oils to your treatment, and whatever you do, make sure you add in a foot massage. It’ll be the best money you’ve ever spent. Head here to see how to have The Ultimate 48 Hours On Hawaii’s North Shore.